Sure, Roses are okay, chocolates are always great, but making something together is the way to really remember the day. Studio 550 is excited to host a variety of Date Night ideas for the month of February. Beginners are welcome in all workshops! No experience is necessary! Workshop participants are invited to take 10% off any additional purchases in the handmade gift shop during the night of their workshop. All workshops are respectfully BYOB. Rose Stained Glass Ornaments – Learn all the steps of making a stained glass rose sun catcher. Assorted Fridays and Saturdays during the month. Sign up here. Succulent Plant Arrangement – You’ve seen them at weddings and on Pinterest, now make your own plant arrangement with a wide assortment of succulent, sedum, and rosette plant babies. Bring some greenery into your home. Sign up here. Adult’s Night Out! 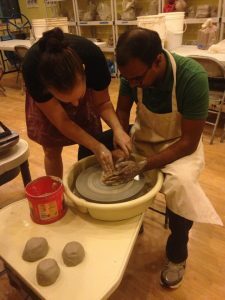 Clay Sculpting – Come create something fun and functional once a month with guided instruction. In February we are creating salt and pepper shakers and next month we are making charcuterie/cheese boards. To see future projects, click the link! Sign up here. Date Night in the Pottery Studio Get a crash course on the pottery wheel with the assistance of a trained instructor. Each person gets their own wheel. 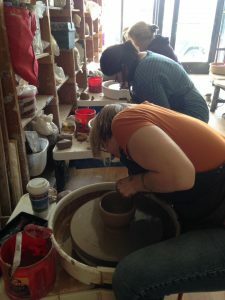 All instruction and materials to create at least one food-safe and microwave-safe piece of handmade pottery per person. Extras can be kept for $5 a piece. Workshops are held Fridays and Saturdays throughout the year at 6PM and 7:30PM each evening. We are also hosting a special 7:30 session on Wednesday, February 13th at 7:30PM. Sign up here.